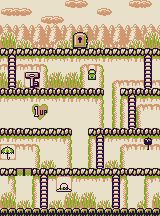 Stage 2-10 is the tenth level in the Game Boy version of Donkey Kong. The stage introduces Sairesu, big-eared creatures that are usually asleep but can hear Mario. Mario starts at the bottom of the stage with two ladders he can climb and a sleeping Sairesu which will wake up and charge at Mario if it hears him land. After climbing the right ladder, Mario can jump up and take the Hammer to defeat the next Sairesu. Mario must then climb up the next ladder where, if he jumps over to the platform on the left, he can obtain a 1 UP Heart, but he must be fast and go back to platform he came from as there is another Sairesu which will quickly charge at him. Mario must then climb up another ladder; from there, he can either jump to the platform next to it or climb up the next ladder that goes to the platform with the door. A Sairesu is present whichever way Mario goes. Mario can go to the platform from the right to wake up the Sairesu so it charges to the right, go back around, grab the key and quickly throw it up the platform with the door, then quickly climb the ladder before the Sairesu reaches him. After that, Mario can simply grab the key and take it to the door to end the level. Hat: Near the start just pass the first ladder. Parasol: On a platform on the left pass two Sand Blocks. Bag: On the platform with the key and a Sairesu next to it. This page was last edited on December 9, 2018, at 07:17.